Analysis: Contributions cool off as last month's projects more reasonable, less generously funded than this year's massive campaigns. Originally written by Marcus Estrada at Cliqist. Hello and welcome to our August Kickstarter campaign analysis! The past few months have been absolutely wild in the world of crowdfunding thanks to no shortage of massive campaigns. For the first time in a long while it seems that this month was mostly free of any outrageous projects (no Shenmue 3 or Bloodstained: Ritual of the Night). For some, this may be a bit of a disappointment as it takes out some of the mainstream attention, but others may prefer these calmer months. Whatever the case, even free of these sorts of campaigns, we still saw a great batch of games make their way through during August. First, we’re going to take a look at some of our favorites from the month. Of course, those hungry to take a look at the data gathered can skip past these first paragraphs to check out the analytical portion of this post. the 13th Doll was a campaign that I initially reacted to with a bit of trepidation. You see, this The 7th Guest fan game looked great, but seemed prime material for a copyright infringement strike. After all, the actual developers of the original adventure game series have tried (and failed) to crowdfund their own sequel! Luckily, everything was squared away beforehand, making this labor of love one that would actually be allowed to proceed through funding, development, and eventual release. This is a huge relief because The 13th Doll looks astonishingly good. It looks as if the original team had come back together to work on another point and click title in the 90s. Okay, so Insert Coin: Inside Midway’s ‘90s Revolution is not actually a video game: It’s a documentary focused on Midway’s success during the 90s. The reason why it still has a place on this list of highlighted campaigns is because a documentary of this nature will almost certainly be intriguing. Midway were a massive power at the time, and the project leader himself has a lot of access to staff and secrets due to having worked for the company in the past! Anyone could have attempted to make a documentary on this subject, but there’s no doubt that his specific relation to the company will create a more in-depth (if fanboyish) film for gaming historians to enjoy. It seems that August may have actually been the month for gaming video content as here is another! Instead of focusing on a specific company, genre, or timeframe, Invisibility Blues: Exploring Race in Video Games looks at games as a whole and examines them through the perspective of racial depictions. The coverage will be broken up into multiple videos much like other webseries’ out there and cover topics such as character creation, women of color and intersectionality, and race in fantasy games. Some of these topics have received bits of attention over time, but there’s no doubt this video series will be many gamers’ first look into such concepts. Learning another language is a goal that many of us have. Of course, the degree to which we actually pursue it varies heavily. In my case, it’s’ fun to imagine learning other languages but there just doesn’t seem to be enough time. Ninchanese is the kind of language-learning software which could be excellent if it works as advertised. Players of Ninchanese will feel more like they’re engaged in a video game than a textbook thanks to cute artwork, gamified learning methods, and achievements. Here’s hoping that it actually can provide players with knowledge of Chinese, as its success could potentially lead to more language learning gamified apps in the future. Before ever hitting Kickstarter, XO drew quite a bit of attention on Square Enix Collective. Thanks in large part to developing an audience via Square Enix, XO succeeded handily on Kickstarter. The game itself is a sci-fi strategy title where you control a fleet of ships. That alone doesn’t sound super duper impressive, so how did the title gain attention? One big part of it, in my opinion, is the visual style which utilizes vector art. The neon green and red ships and lasers are set against a grid-based galaxy in a way that just looks superb. Of course, the actual strategy gameplay itself looks like quite a bit of fun, too. Don’t be shocked. 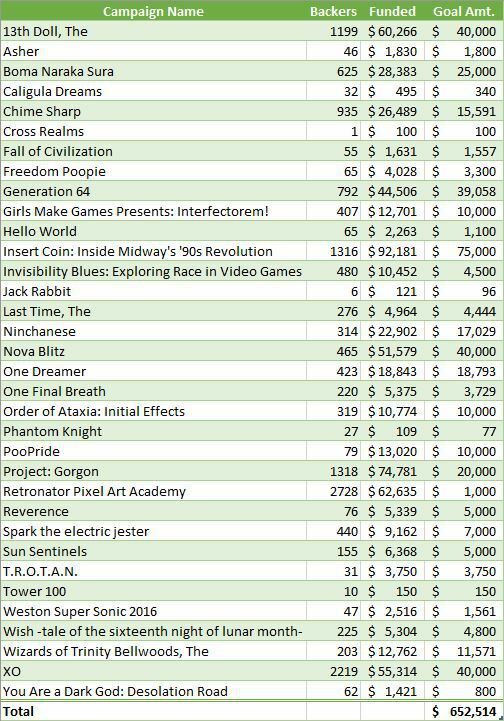 The total amount funded on Kickstarter this month for video game-related projects was $652,514. This sum is less than some single campaigns make during their month on the site. It also happens to be a much smaller value than July’s $8 million in funds. How the heck can August be so low? Well, the fact is, the numbers are deceiving. If you don’t remember, last month saw both Shenmue 3 and The Bard’s Tale IV close up with millions each. In fact, those two campaigns alone practically ate up $7 million of the total raised. As such, when we realize that there were no monolithic campaigns this month, we can see a clearer view of how “typical” project funding adds up. Which projects did the best? The top three would be Insert Coin: Inside Midway’s ‘90s Revolution with $92,181, Project: Gorgon with $74,781, and Retronator Pixel Art Academy with $62,635. Of course, some will immediately point out two of the three aren’t even games! So, let’s go down the list a bit more to grab some excellently-funded video games. Those two titles next on the list are The 13th Doll with $60,266 and XO with $55,314. In total, there were 34 successful projects which is a few more than July’s 31. It seems even without Kickstarter being all over gaming sites, there are still a stable number of projects being funded, which is always a good thing! It’s worth noting that all this funding data includes a $100 raised by Phantom Knight. However, this campaign was canceled despite getting fully funded. It is included in the data because the project did succeed, and therefore should be counted as a part of totals, but in the future we may change how to handle these odd campaigns. So, let’s take a deeper look at these 34 Kickstarters to see exactly how much money they asked folks for. The total of all funding goals for August adds up to $422,146. That seems small compared to July’s $3 million mark, but again, much of those funds asked came from the two or three massive projects which ended during that month. When it comes to averages, the average goal value between each of these was $12,416. This sum falls a bit lower than the general average. Once you removed the statistical anomalous campaigns of July, the average funding goal was still a bit higher at $20,008. Why is there such a few thousand dollar difference this time around? It’s hard to say for sure, but it seems that more successful projects this month were asking for sub-$1,000 (six of them). This isn’t necessarily a good thing. Some make sense, such as when someone launches a Kickstarter in order to simply pay the $100 Steam Greenlight posting fee. However, for August specifically, four campaigns were of the “low information” variety. By this I mean the projects have very little information presented — less than two screenshots and a couple paragraphs. Three of the four low info campaigns correspond to sub-$1000 goals, which makes sense but is also potentially unfortunate. My belief, however, is that most of these projects were funded via friends and family rather than people stumbling on a page and spontaneously backing it. Now that we know how much money was raised in total, as well as the amount asked, let’s look at the average degree to which all 34 projects were funded. The average dollar value split between them all is $19,192. That’s not bad! Though, it is lower than July once again. The adjusted average for last month was just a tad under $30,000. Just as the previous average was dragged down, this one may also be skewed thanks to the proportion of sub-$1000 campaigns. With all that said, there’s no doubt that many prospective Kickstarter users would be thrilled to receive anywhere near $19,000 in funding. Curious to see each campaign which made it in August? Scroll down to the bottom of this post to find a complete list. Now let’s turn our attention to the timing for funding between these 34 Kickstarters. Every so often it is possible for a campaign to find itself funded in the very first day. This is exceedingly rare, however, and that rarity seems to show no signs of changing. Last month, three projects were “day 1” hits while August has one less with two projects. Still, it’s unlikely we’ll ever see this number increase substantially. The ratio for the rest of the timeframes also holds fairly close to July, with just a slight increase on the “between days 2 – 10” section. 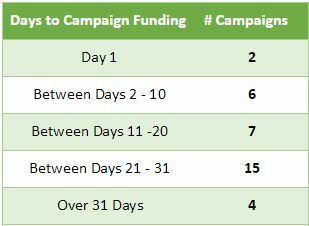 The “over 31 days” section corresponds to projects which give themselves more than the traditional 30/31 days for their funding period. Four projects had 40+ day campaigns, and three of these were only funded in the last few days. This seems to prove that elongating your campaign may actually be a bad thing, in that it does not lead to extra funding — just a very stressful run in which your game is barely funded by the end. Another tidbit of information being gathered monthly now is the currency used for each campaign. As usual, USD rules the successful club with 23 projects. Next is Pound with 5. Then comes AUD, CAD, and Euro which all represent two games each. The amount of USD $ projects is a tad higher, without similar increases for any currency other than Euro. What does this all mean? I’m not sure still, as this information alone can’t be used to determine region of development. After all, there are many times when projects will state they’re from another country while using USD and the like. If you have suggestions of what you might like to know more about in regards to currency, then just post a comment with the suggestion! After the superbly silly bar charts from June and July, August looks far less unusual. No campaigns this month saw such a huge proportion of backers that everything else was dwarfed in comparison. I’ve switched this display to showcase campaigns from ones with the most backers to least, but if you don’t enjoy that view just let me know which you’d prefer. In any case, we can see here that Retroantor Pixel Art Academy drew the most people to it with 2,728 backers in total. Other top funded campaigns of the month also follow with the most backers. This just makes sense. When looking at backer stats, we see that a maximum of 15,661 contributed this month. The true number is lower as many backers pledge to more than one campaign during any given month. 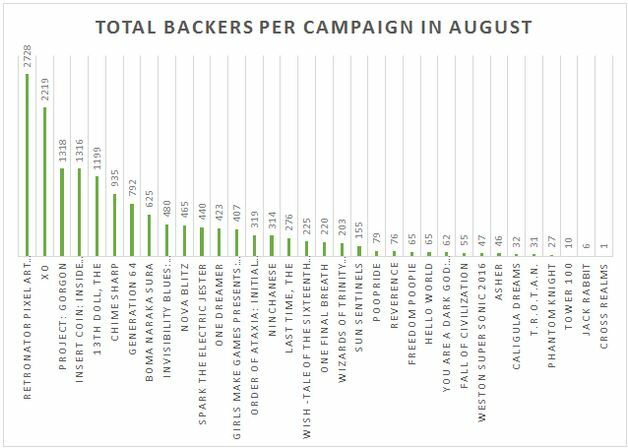 As for averages, there was an average of 460 backers for each campaign, though there’s no doubt our few star projects have extended the number to some degree. Speaking of averages, what was the average pledge per backer to these projects anyhow? The average backer per campaign contribution for August is approximately $46.31. It’s important to note that this was derived simply from dividing backers from total funded rather than specifically tallying how many backers contributed to each specific tier. As such, it’s a bit inaccurate, but given the time the latter method would take, is what we’re continuing to work with. July’s backer average came up to $45.80, but when you removed high profile projects it actually deflated to $35.29. The fact that August actually did higher without having big names hoisting up monetary values is intriguing. Finally, here’s some information regarding funding tiers. The average lowest tier was $4 while the highest available averaged out to $2,524. The average game reward tier average was $13. There is always more information to generate from Kickstarter video game campaign data, but these are just the most notable tidbits to us. If you’d like to know something else (more specific to one campaign, or other stats) then please let us know in the comments with inquiries and suggestions. We look forward to continue sharing monthly wrap ups throughout the year! You can review analysis and wrap-up articles from previous months using this link.